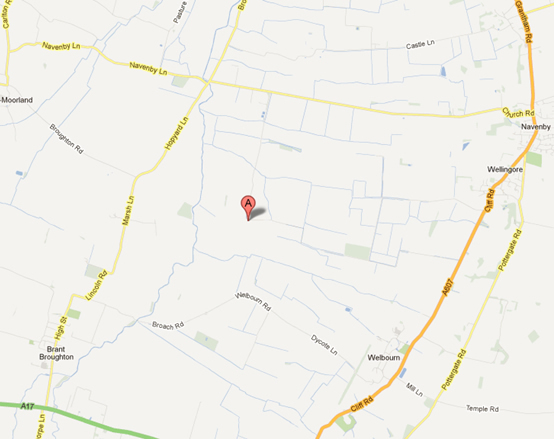 We are located about 4 miles from Navenby off Skinnand Lane. Take the A17 for Sleaford. After 4 1/2 miles take a left, signposted to Brant Broughton. Go through Brant Broughton and after 3 ½ miles turn right ( sign for Navenby) Go ¼ mile and turn right onto track and past the blue iron gate. Continue up track and over bridge for 1/3 mile. (Do not go past Porters animal feed otherwise you have been tricked by the satnav). Once in Navenby which take the sign for Bassingham turning by the fish and chip shop. Go past the church and down the steep hill. Continue for 3 miles. Turn left onto track just after Porters animal feeds going past the blue iron gate. Continue up track and over bridge for 1/3 mile. Take ‘Aubourn Haddington’ Turn off and continue through Haddington to Aubourn and then on towards Harmston. Turn right after 2 miles when you see Brant Broughton sign. Go 3 ½ miles and turn left by flat bridge at sign for Navenby. Go ¼ mile and turn right onto track and past the blue iron gate. Continue up track and over bridge for 1/3 mile.